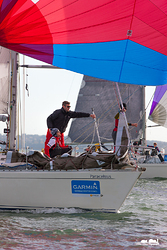 Coming at the end of a week of pessimistic weather forecasts, it was little surprise to both competitors and the race committee that the scheduled start time of the fourth race day of the Garmin Hamble Winter Series was marked by a flat calm, two hoots and an AP. But it was a day of surprises – firstly that the end of British Summer Time would be marked by warm temperatures and blazing sunshine, and secondly that a light southeasterly breeze would fill in at around 1230. 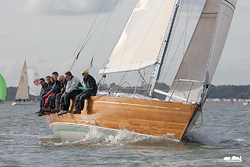 This came as a particular shock to the boats that had decidedthat there would be no racing today and who had started motoring home – resulting in a few hurried U-turns and high engine revs as they tried to make it back to the startline in time! 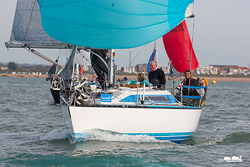 The wind never rose above 6- 10 knots, but that was plenty enough for race officer Kathy Smalley to fit in a short race with the same course for all classes -a triangle between HYS, Hill Head and hamblewinterseries.com buoys. 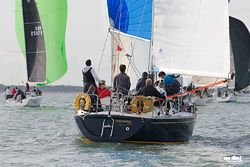 Many classes saw the overall winners surprised and in some cases back towards the rear of the fleet in the light and shifty breeze. First away were IRC 0, where Cornel Riklin's Jitterbug added another first what is a perfect run of bullets. 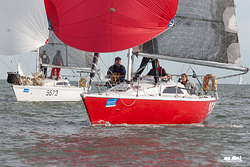 In IRC1, James Wilkie's Fast Tack Puma knocked Philip Farrands' Old Mother Gun off her perch at the top of the class to win the race. Old Mother Gun finished second, with Allie Smith's Galahad of Cowes in third. A Z flag flying from the committee boat caused some issues in IRC2, with two boats affected, including overall leader Mike Moxley on Malice joining Paul Ward on Eat Sleep J Repeat in being penalised for being over the line. Nonetheless, Eat Sleep J Repeat finished first, with Robbie and Lis Robinson on Hot Rats second and Mike Bridges' Elaine in third place. In IRC 3, Robin Stevenson on J/92s Upstart pushed class leader Blackjack II into second place, with Jonathan Stevens' J/97 Windjammer completing the podium for the day's racing. In the Sigma 38s, things were mixed up a little, and as such it was Light that topped the class, ahead of Kindred Spirit in second and Persephone in third. IRC 4 saw a very close finish, with under a minute separating the top 5 boats on corrected time. Overall leader Stan the Boat added another bullet to her score, finishing nine seconds ahead of Impala 28 Polly, with Mustang 30 Respect in third. The 8-strong Impala fleet, racing in IRC 4, was topped by Polly, pushed hard by Two Frank and Uproar who finished second and third respectively. 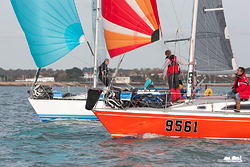 Day prizes were awarded to the top three boats in each class at a packed prizegiving at Hamble River Sailing Club by day sponsors, Wadworth's Brewery. Race Officer Kathy Smalley thanked the organisers, race team, mark layers and competitors for a great series so far. Next weekends sees competitors and organisers alike take a well-earned break, before the series resumes the following weekend. We look forward to seeing you then!